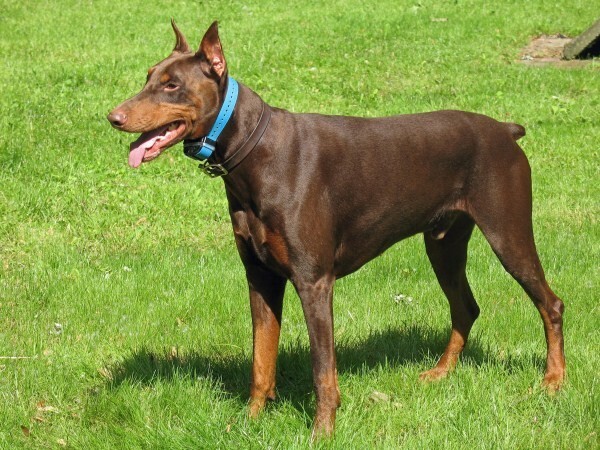 I bought my first Doberman Pinscher in the early 70s, fell in love with the breed and have owned one ever since. When I was searching for a new puppy using the UDC, DPCA and other resources, I found Larry and Linda Kye who run the L. J. Kye Kennels. I had several conversations with them and was impressed by their breeding program, health screening and training goals. I determined that their philosophy was exactly what I was looking for. 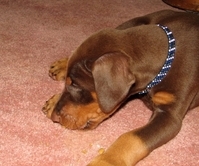 I purchased my most recent Doberman Pinscher puppy (Jake) from the Schatzi/Topper breeding. Linda Kye was kind enough to send us these pictures of Jake at 38 days. Jake's travel to Rochester was less than simple. The Kyes drove Jake from the Little Rock area to Memphis. I flew from Rochester to Memphis and met them there. I then flew with Jake to Pittsburgh where Chip picked us up and drove Jake and I back to Rochester. The airline rules stipulated that in order to be in the cabin: a) Jake had to weigh 15 pounds or less (he was 15 on the nose!) 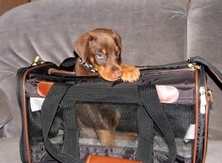 and b) Jake had to fit in an approved carrier. 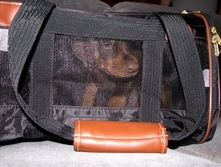 It was a tight fit, but the airline attendants allowed the carrier's zipper to remain open so that Jake could be petted and have enough room to turn around. As it turns out he slept through almost all of the trip. Jake joined our household at 8 weeks of age. 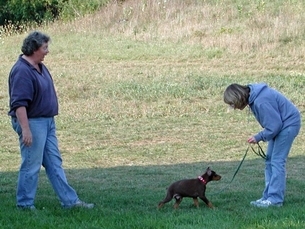 He started his training with Loel Turpin (vom Koby Haus Dobermans) almost immediately. He was an eager learner and quickly picked up the basics of recall, sit, and platz (lie down). With some more work and a lot of practice he passed his Canine Good Citizen (CGC) test. As well as the elements of basic and Shutzhund obedience, he began to learn tracking. He started with scent pads, then short tracks, followed by learning to recognize and indicate articles. His mother's search and rescue talent has certainly served him well. Over the years, Jake's obedience continued to improve and his tracking ability was outstanding. Although he never formally competed in a tracking competition, he was successfully completing IPO-3 tracks and the occasional FH-1 track. But most importantly, for me, Jake became "THE" dog. The one that I had always wanted and hoped to own. He was not perfect and had occasional lapses, but he became my ultimate canine companion. Jake - all grown up! Sadly, on July 14, 1914, Jake was helped by his Vet to cross the Bridge. I will miss him always. Jake (Kye's Jacob Windwalker Ascendant CGC) was born at the L. J. Kye Kennels of Larry and Linda Kye in Little Rock, Arkansas.